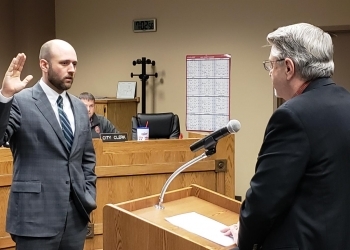 Bartlesville Mayor Dale Copeland administered the oath of office to City Attorney, Jess Kane Monday night. The council also awarded the bid for repairs to the golf course bunkers at Adams Golf Course. The bid went to United Golf of Tulsa for 143 thousand dollars. The council approved a contract with Jonesplan LLC to act as Construction Manager for the Tower Center at Unity Square project. Jonesplan will be paid 17 thousand dollars for the preliminary work on the project. Water Utilities Director Terry Lauritsen that amount of the Maximum Price contract will be determined once the majority of the planning work has been accomplished.